Washington, DC—The TSA is right on top of the IRS when it comes to fear and loathing. The TSA has wasted billions on the illusion of security through their program of privacy invasion, theft and sexual assault. Flying today America has all the fun, glamour and excitement of experiencing the police booking process for criminal suspects. 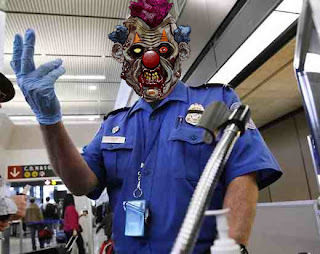 The TSA has brainwashed the public into believing they are effective and necessary despite the fact they are neither. The TSA has their own internal propaganda machine that will blitz the media with press releases to justify their existence to the public. Whenever one of the millions of passengers that flies daily forgets that they had a legal self-defense weapon in some case brought to the airport the TSA spin begins with disinformation. “Today a man was arrested after he attempted to bring a loaded gun on to an airplane”, proclaims a press release. What’s left out of their self-serving information was that the middle-aged man had no criminal record, known agenda for terror or other evil motivation. The man, simply forget to remove the weapon from his bag. Often it’s a retired cop or security professional. The TSA’s zero tolerance policy and pettiness is never reflected in their propaganda material. Likewise when drug offenders are discovered the TSA never reminds anyone that are not there for drug enforcement purposes. The TSA is always looking for any way at all to cause the arrest of passengers for publicity purposes. Their hope is that the public is brainwashed into believing that without the TSA we’d all be dead. Frankly the TSA screeners do miss a lot of guns and knives that are intentionally introduced by their own testers. The fact that undiscovered weapons are never involved in incident or terror and mayhem is very telling about the actual need of the program. The fact is that the TSA has yet to derail a single terror plot since their arrival more than a decade ago. The FAA private security contractors were far less intrusive and no more effective than the over-hyped, over-funded and self-promoting TSA. Until the mid 1970's we had no security screening whatsoever in our air transportation system. America is in an economic crisis. We need to generate jobs and a good place to begin is in the tourism and hospitality industry. Billions of dollars have been lost because people hate the TSA’s behavior and refuse to fly. We must return fun to air travel. Most Americans have never experienced what it was like to fly decades ago. It was an enjoyable experience for nearly everyone. Instead of the evil eye passengers were greeted with smiles and great service. Your friends would meet you as you stepped of the airplanes instead of camping out by baggage claim. Why fly and subject yourself to abuse, humiliation and indignity? Sheep being conditioned into a false sense of fear by the fear mongering New World Order! US Senator Rand Paul is calling for the abolition of the unconstitutional TSA. Call him and express your super of the defense of civil liberties and the destruction of the fascist state.